September Article 28 - We are enjoying the right to an education by planning what we want to learn about through our topics. July - Article 31 We have the right to relax and play. We have enjoyed taking part in sports day and going on school trips. June - Article 6 We have the right to life and be healthy. We have enjoyed taking part in health and fitness activities. May - Article 2 We have the right to a good standard of living. We are helping other children to have their basic needs met through fundraising for local charities and CAFOD. April - Article 2 We have the right to food, water and medical care. We have enjoyed visits from the School Nurse telling us about how to be healthy. We have enjoyed learning about Wales and celebrating during our St. David's Day concerts. February - Article 2 We have the right to have rights. We have enjoyed raising money for important charities such as Velindre Cancer Care and HCPT. January - Article 29 We have the right to be the best that we can be. 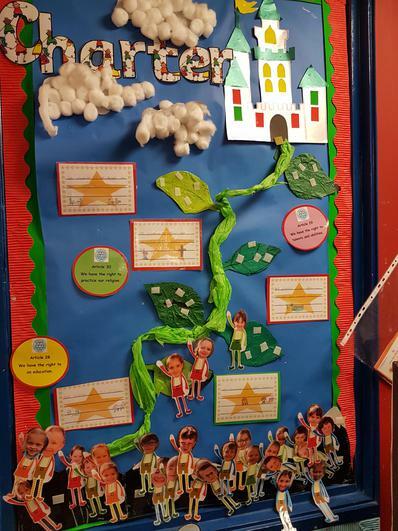 We have enjoyed making new year promises and setting new targets. December - Article 14 We have the right to follow our own religion. We have been enjoying celebrating Jesus's birth through our Christmas productions. 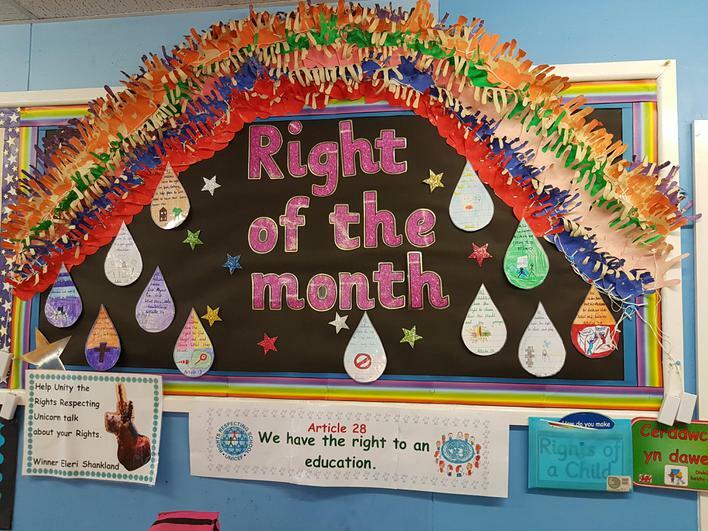 November - Article 19 - The Right to be safe. We have been enjoying the right to be safe on Bonfire Night. We have been learning about Remembrance Sunday. October - Article 15 - The Right to join groups. We have been enjoying the right to join new after school clubs, such as Boris the Bookworm and Chess. We have formed a new School Council and Eco Committee. 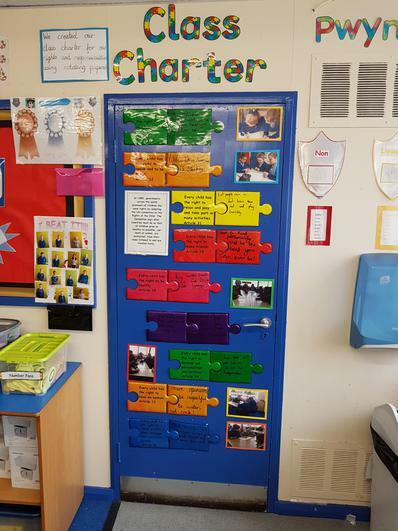 Through the year we will be learning about many of the articles of the UNCRC. We will be focusing on these articles every month. 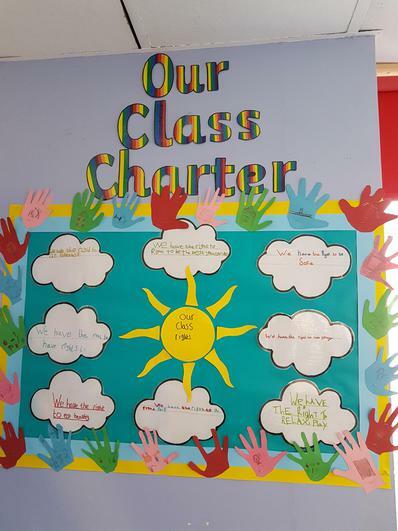 Here are some of our class charters. 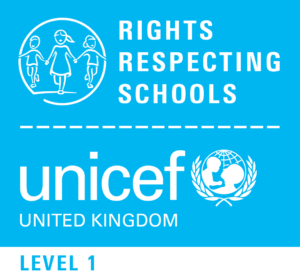 We are incredibly proud to achieve Level 1 in the Rights Respecting School Award. These are some of the things we have done in our Rights Respecting journey during the last 12 months. * Written letters to Prime Minister Theresa May to complain about poverty not just in Merthyr but round the world - Article 12 - Right to give your opinion. * Created class charters - Article 28 - Right to an education. *Held a Harvest festival as part of our CAFOD work to support families in our area through Merthyr foodbank - Article 24 - Right to food, water and healthcare. * Attend mass at St. Mary's church every Wednesday to celebrate - Article 14 - The right to follow your own religion. *Celebrate St. David's day by enjoying performances in art, singing, dancing, music and poetry - Article 7 - Right to a name and nationality. * Present information to Governors, pupils and parents - Article 12 - The Right to be heard and share opinions.